Custom painted Rockabilly upright double bass fiddle. Choose Black, Blue, Brown or White Bass color or ask for custom color detailing! Choose one color RB-2 flames or the two-tone more flamed RB-3 Paint Jobs. The RB-2 is a simpler 1 color flame front and back only, while the RB-3 has 2 or 3-tone flames and flames on the sides too. You can request flames in a pattern you want, give us your input to create your personalized bass. You can upgrade the paint job to several colors in the flames, more pinstriping, you name it. The 2nd bass pictured above is one we customized for Ron Aurand for a few hundred more than the basic RB-2 paint job. As you can see it is quite nice, GOORGEOUS in fact! Get yours customized to suit you ! 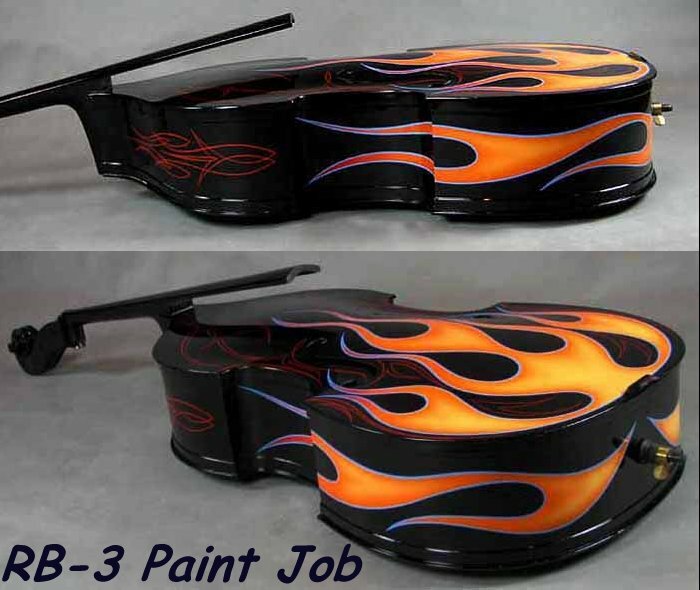 The pictures just below here are of a black bass we custom painted in shaded flames with lots of pinstriping. This is also an RB-3 Paint Job, orderable in the colors you want. Laminated wood rockabilly upright bass painted for stage work. $195 Pro Setups will get fingerboard reshaping work done to create a PRO Playing bass! (Pro setups fix the action so you can even play jazz with steel strings on this bass if desired). Free Basic Setups will lower the action from ridiculously high to kinda high but playable with the nylon strings. Comes with basic Rockabilly set-ups. Lowered nut and bridge. Optional Pro Setups available for $195.00. Action is low for excellent slap action but not so low that it's hard to grab the strings to pull up. We make it a quick smooth playing action for you. Shipping is $159 to a Qualified* Commercial address and requires the address to be located within 30 minutes, or so, of a major city, on major U.S. shipping arteries and not more than 800 miles or so from our shop in Pasadena, CA. An Upright Bass is too large to ship via conventional carriers like FedEx and UPS and “Oversized” carriers like freight lines and trucking companies must be used. These oversized freight companies play by different rules than you are used to. For example, they will call you to set a delivery appointment, usually a 2-hour window. If you don’t keep this appointment they will charge you $50 to $70 for “redelivery”. If delivering to Commercial addresses they will not call to set an appointment, they will deliver during regular business hours of 8-5 and expect you to be open. If you are not open at those hours you should contact them at the # provided with the tracking and receiving information that will be emailed to you, and arrange delivery during your business hours. A Qualified* Commercial Address is defined as a business address in an area that is incorporated or “Zoned” Commercial and where a large truck has “easy access”. Easy access means a commercial address with a shipping & receiving dock or a place that is directly adjacent to an entrance not requiring any additional handling, i.e., stairs or anything past the front door. There are additional handling charges for those and other services. In short, anything other than driving up, dropping off the shipment and driving away is charged for. When choosing the “Commercial Address” option below be sure to include the name of the Company in the checkout process. The customer will need to make up the difference between the initial $159 shipping and the actual shipping costs. In any case, FMI will contact you if there is additional shipping due. RB-2 Rockabilly Painted Flames Desired Color: CreamBlackRedGreenName Your Color!